Two years ago, many working class communities ravaged by austerity demonstrated enough was enough and got out on the streets against water charges. One such community was Jobstown in Tallaght, where a spontaneous protest inconvenienced Joan Burton for a few hours. The establishment media jumped on this and tried to demonise those involved as a “dangerous fringe”. Fast forward two years and 19 people who were at the protest that day still have court cases with very serious charges hanging over them. The first of those was concluded last month and found a 17 year old guilty of “false imprisonment” – simply because he took part in an anti-water charges protest! 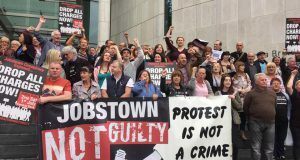 If anyone still had illusions that surely something as simple as a sit down protest could not be construed to be “false imprisonment”, this guilty verdict should be a wake up call for us all – the political establishment is deadly serious about using the Jobstown trials to criminalise protest. The water charges movement delivered a humiliating blow to the establishment and has had far reaching consequences, both political and in terms of giving workers the confidence to fight for better pay and conditions. The elections reduced the traditional political hegemony of Fine Gael and Fianna Fáil to the dust bin and forced the establishment to come up with a creative version of a “grand coalition” as the only way to keep control. The Labour Party was annihilated. Their climb down on water charges showed up how weak this government is and how movements on the street can force further concessions out of them and put them under ferocious pressure. The Jobstown trials have to be seen in the context of all this. They are an attack on the entire water charges movement, the act of a vengeful establishment that can’t accept that people power put manners on them. Therefore we need to stand shoulder to shoulder with the 19 activists singled out. Even more ominously, this is about strengthening the state’s hand in future protest movements. If we let them away with defining a sit down protest as false imprisonment, it will have far reaching consequences for the democratic right to protest and effectively picket. This is also clearly a politically motivated attack – against the most radical and effective wing of the water charges movement, against those who clearly advocated a mass boycott campaign of the charge, namely the Anti-Austerity Alliance. 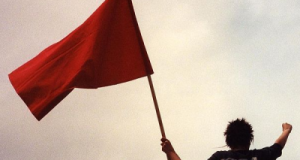 At heart, it is an attempt to halt the growing support for an anti-capitalist alternative that challenges the interests of the 1% and stands for an independent anti-capitalist voice for working class people. 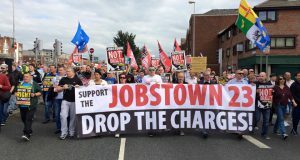 In order to get away with this blatant attack on our civil rights, the judicial, political and media establishment will combine to try and isolate and criminalise the Jobstown protesters. Our first and straight forward argument against such slanders is simple – the FACTS. No matter how they try to portray the protest, the fact of the matter is that the judge in the children’s court found a 17 year old guilty of false imprisonment based on just three pieces of “evidence” – holding a phone asking Joan Burton to speak to him, using a megaphone and taking part in a sit down protest. This guilty verdict was essential to the establishment to be able to push through the cases against the 18 adults – no matter how absurd the evidence. Our second argument has to be to point out the political context of this trial. This is a stitch up that should incense every one of us. The workers’ movement, here and internationally, has had to face harsh repression before – as far back as striking workers 100 years ago to the miners’ strike in 1980s and the people jailed for protesting against the bin tax 12 years ago. The IWW, in the face of such repression over 100 years ago, coined the powerful slogan “an injury to one is an injury to all”. Let’s take heed, get organised and prevent the establishment from isolating our fellow protesters in Jobstown. Spread the truth and through workers’ solidarity ensure we stand up for our democratic right to protest.